Hello, hello! Happy Thursday and thanks for stopping by today. I've got something fun to share with you. Do you remember the card I shared yesterday? It had a tribal background and was bright and bold? Well, today I want to share a card that I made using the same set that is completely different. 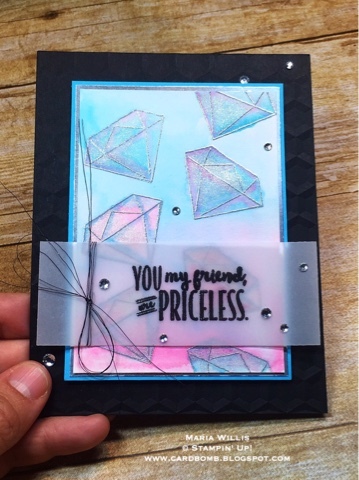 I used You're Priceless (soon to be released) and this time I featured the huge diamond from the set. I watercolored this card with two colors... and I think I used Tempting Turquoise and Melon Mambo. I'm sure of the turquoise but not a hundred percent sure of the pink (sorry!). Anyhow, at the top of the card I did a TT background and at the bottom I used MM. I used the same colors to watercolor the diamonds but made sure that they would contrast with the background. 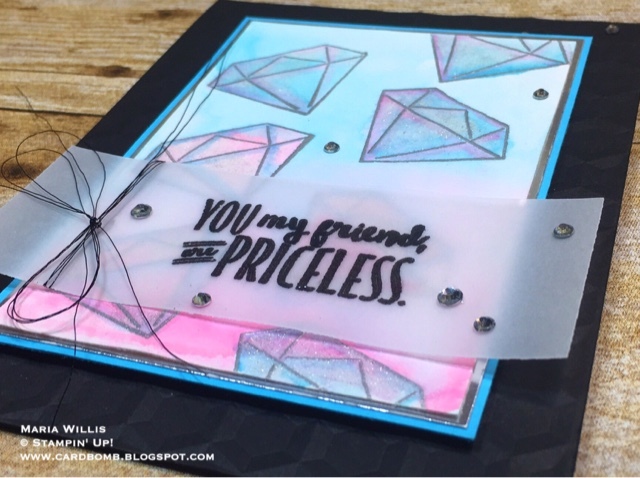 I love the way the colors blended together on the diamonds. 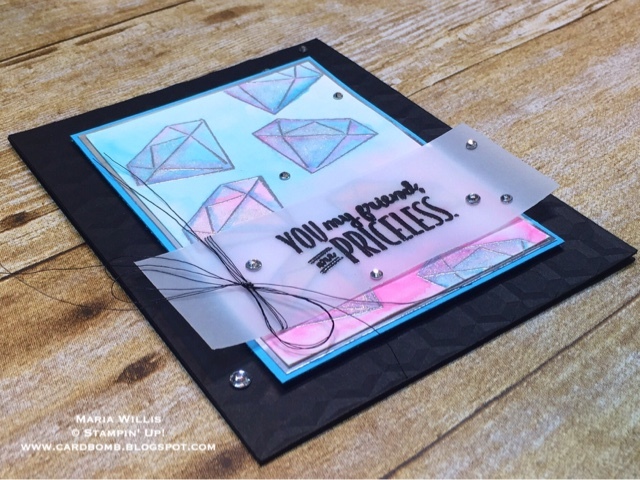 I added a ton of Clear Wink of Stella to the diamonds and popped my watercolored piece up on silver foil, Tempting Turquiose and then on some embossed Basic Black. A sentiment on vellum, some black metallic thread and rhinestones finished this baby off. It's such a different card from yesterday. That's something that I love about stamping-the possibilities are pretty endless! Well, I'm on break at work right now so I better get back to it! Have an amazing day y'all! See you soon! !